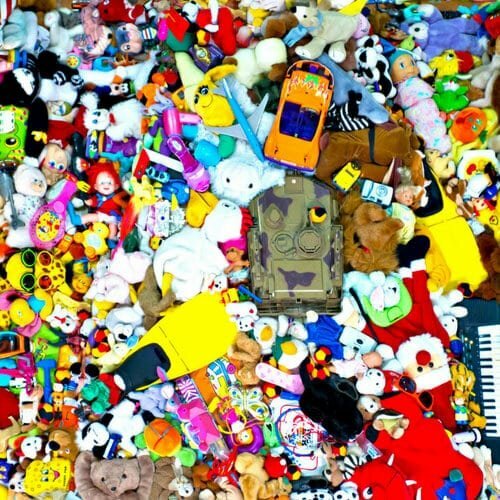 Do you struggle with toy clutter? Oh my, so do I. I adore my kids and want them to have everything, but not at the expense of my mental health. When you have one shared space for living, playing and relaxing, toy clutter can quickly get the best of you. What do your kids actually play with? My boys pretty much stick with the plastic dinosaurs, hot wheels and fire engines etc. I have zero interest in inciting World War 3, so I will steer clear of the beloved toys. One thing I have noticed when tackling toy clutter is that less is definitely more. I find the fewer toys in the toy box, the more they get played with. Keep your kids’ favorites around for them to play with and they will hardly notice the excess disappearing. Are you hanging on to baby toys or toddler toys, even though your kids don’t play with them? If so, you’re not alone. Of all the toys, getting rid of the baby toys were the toughest for me. Giving them away meant I was done having babies, and I really struggled. In fact, almost immediately after posting them on my local online message board I had ‘buyers remorse’ and told my husband I would remove the posting. He talked me down from the ledge, and shortly after I received a message from a new mama who was going through hard times. She later sent a photo of her baby playing with the toys and I felt a flood of gratitude. At being able to help another mother, and also that I hadn’t removed my posting. This was a month ago and my kids have not even noticed. I’m looking at you kinder surprise/happy meal and co. You are the toys I despise the most. You get in the strangest places and hurt my feet when I step on you. I’m taking the power back and saying no more. So yesterday I was able to remove a full plastic bag of happy meal type toys from the toy box without the kids even seeing me. I’m donating these to my local charity store, who resell them by the bag-full. Often the culprit of those nasty little toys are fast food joints or birthday party swag bags. The simplest way to avoid these sneaky little beggars is to not allow them in at all. That means no more happy meals for us. It’s cheaper to just get a plain burger and fries anyway, BYO water. Giving or donating to other kids in need is a great way to clear toy clutter. BUT, how you approach this strategy with your kids depends on their age. Mr 5 is starting to understand how privileged he is, and is showing a genuine interest in helping others. Yet, just 12 months ago he wouldn’t even pass a toy to his baby brother without a tantrum. If your kids are older, talk to them about passing on the toys they don’t use to other children. No playroom? No problem. It doesn’t have to be an entire room but toys need somewhere to live. For us, it’s a corner of our living room. That’s not to say the toys stay in the corner. Nope, the toys go everywhere (I swear there’s a conspiracy), but at the end of the day when we have tidy up time (thank you preschool for instilling that wee nugget) the toys go in the same place. It means that hubby and I can enjoy the evening in our living room being stressed out from toy clutter. 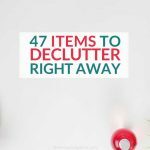 Quite often, clutter is caused by simply not having enough storage. 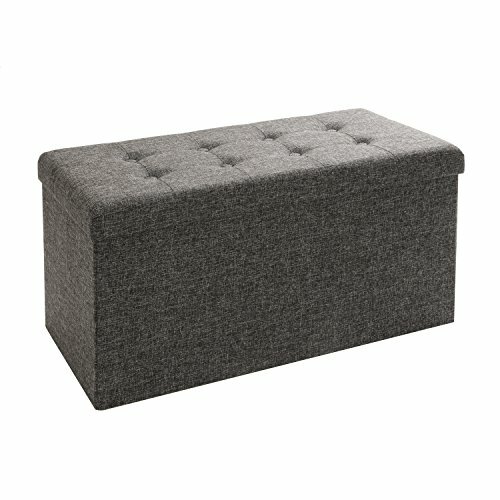 In my small house, I need to have items that serve at least two purposes, which is why our toy box doubles as a bench. It has a hardtop that can be placed over the box when visitors are coming and used as extra seating. 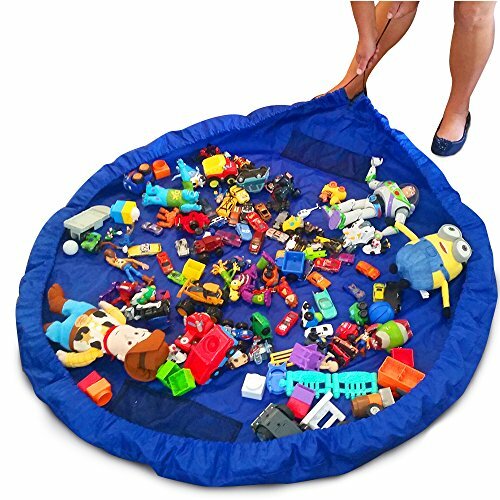 We also have the best Lego storage/toy organizer – a play mat which folds out for play and then becomes a storage bag when it’s time to go away. It’s genius! When the kids are older we’ll probably invest in a nifty lego table with storage. For things that we barely use, we put them in a drawer in our storage bed. I know my parents and in-laws get great joy from my children and love to spoil them. I don’t want to take that joy away from them, however, my house can’t fit any more stuff. Both sets of parents now know that we live in a very small space and we don’t need any more toys (implementing a gift policy is something I’d recommend). Any toys they purchase must be kept in their own houses, for the kids to play with when they visit. The only exception to this rule is Lego. They now try to give an experience (zoo tickets, movies) or cash. What is a toy library, I hear you ask? A library for toys. It’s the ultimate tool in a minimalist parent’s toolbox. In my area, you pay a small annual membership fee and can borrow items for three weeks at a time. Toy libraries are so great for keeping toy clutter at bay as they are usually high-quality toys and they still have the ‘new’ factor so kids play with them a lot. Sometimes returning a new favorite toy back to the toy library is a struggle for children, so we try to make a big deal of choosing a new item to play with and spend a good bit of time at the toy library deciding which toy we’ll take next. Tip: Some toy libraries offer discounted membership if you volunteer to help out, and you can usually bring your kids along. It’s a great budget buster. I truly believe that kids are overwhelmed by too much stuff, including toys. And by having too many toys available we are teaching them to value less, which is not how I want my boys to grow up. 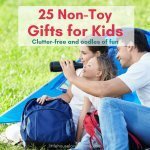 Moms you can beat toy clutter. By utilizing these strategies you can keep your home calm, your kids happy and your sanity intact.